By following our complete Gansta Ransomware ransomware removal guide the victims can learn how to restore their computers and files from the threat. How Does Gansta Ransomware Infiltrate the System? Gansta Ransomware can be acquired by falling victim to one of the hacker strategies used for spreading viruses. A popular method is the coordination of email spam messages that use social engineering tactics. The messages appear as being sent by famous companies and include the Gansta Ransomware either attached directly or linked in the body contents. The Gansta virus code can also be bundled in payload droppers – infected documents or software installers containing malicious scripts. The Gansta ransomware is attained after the target interacts with the applications. Browser hijackers and other malicious add-ons can also contribute to an active infection. Hacker-controlled download sites and P2P networks are the most popular ways of distributing them. Future campaigns may also see the use of direct hacker attacks. The criminals can search for outdated software installations and use the weaknesses to install the virus. Gansta ransomware is a newly detected computer virus that is still in development. The discovered Gansta virus samples are made by an unknown hacker or criminal collective. At the moment the Gansta virus contains only a basic encryption engine that using a strong cipher processes them. Usually this is done by following a built-in list of target file type extensions. Most other viruses of this type seek to affect all popular formats: videos, music, photos, configuration files, archives, backups and etc. We suspect that future versions may use a ransomware extension to mark the processed files. 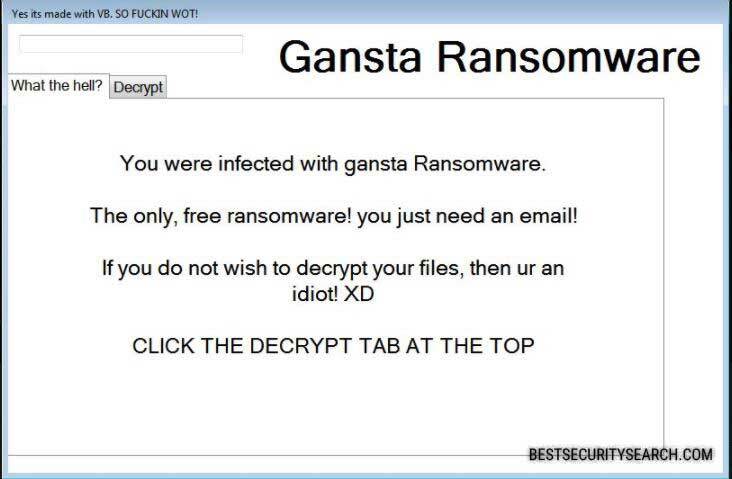 You were infected with gansta Ransomware. The only, free ransomware! you just need an email! The ransomware note does not quote a ransomware sum in this version of the Gansta virus. This is probably due to the fact that the captured samples do not encrypt all target file type extensions or none at all. The text shows that the victims are guided to send an email to the hacker behind the threat with a message. Upon contact they can negotiate the private decryption key. If the Gansta ransomware is not a joke virus or a prank application a future version of it may include additional modules. They may infect the victim computer with other malware or spy on the users with a Trojan component. WARNING! Manual removal of Gansta Ransomware requires being familiar with system files and registries. Removing important data accidentally can lead to permanent system damage. If you don’t feel comfortable with manual instructions, download a powerful anti-malware tool that will scan your system for malware and clean it safely for you. WARNING! All files and objects associated with Gansta Ransomware should be removed from the infected PC before any data recovery attempts. Otherwise the virus may encrypt restored files. Furthermore, a backup of all encrypted files stored on external media is highly recommendable.